The forecast indicates a snow storm for Seward on Saturday, February 16th. Due to potentially unsafe driving conditions between Anchorage and Seward, the 2019 AAS Seward Winter Birding Field Trip scheduled for Saturday, February 16th has been canceled. It was a difficult decision, but safety and everyone’s well being was uppermost in our minds. We apologize for the inconvenience. If you know someone who was planning on going and might not see this notice, please let them know that the event has been canceled. Thanks. 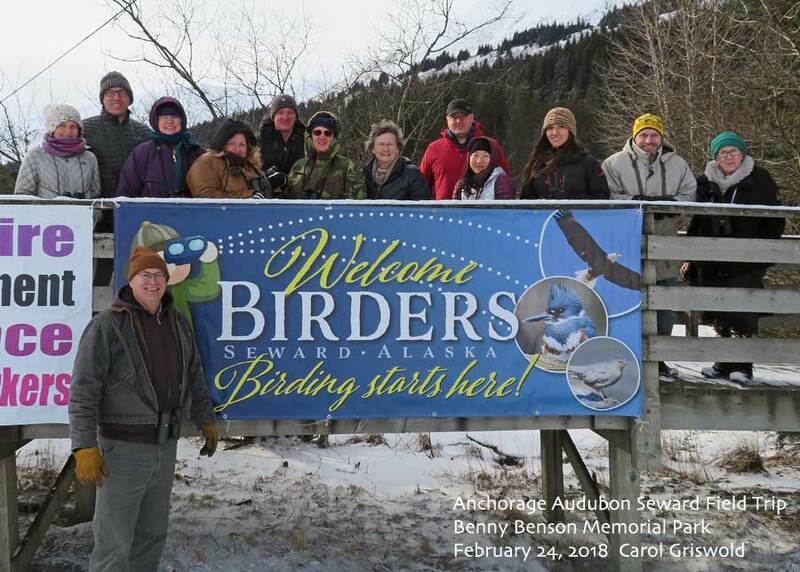 Join Andrew Fisher and Anchorage Audubon for a free winter birding excursion to enjoy Seward’s diversity of wintering birds and the possibility of a few rarities (Pie-billed Grebe, Hooded Mergansers, etc.). Come dressed for a variety of weather conditions, bring your ice grippers, and plan for a fun day with great company! Bring your binoculars and spotting scope (if you have one…there never are too many! ), your field guide, and other favorite birding gear. You may also wish to bring walkie-talkies/cell phones to communicate between cars. Donations of sunflower bird seed or chunky peanut butter are greatly appreciated for one of our regular bird feeder hotspots. Plan on gathering with the group back at the Harbormaster’s for a midday restroom stop and lunch; bring your own or buy it locally. We’ll meet there again around 3:30 PM to regroup for the return trip to Anchorage. Carpooling to Seward and while in Seward is highly encouraged. Bring money to cover your share of the driver’s fuel expenses. Drivers and trip leaders are not expected to contribute. If you are interested in carpooling (driving or riding) from Anchorage, meet in the parking lot (South end, near Huffman) of Carrs on Huffman at 6:45 AM. All participants are required to sign a standard liability waiver (which will be handed out in Seward). In the event of a cancellation there will be no reschedule date for this trip. Contact Andrew Fisher at mzeesamaki@gmail.com or 619-937-1086 with any questions. Birds and Boats! What could be better? The birders get a bit hungry too!